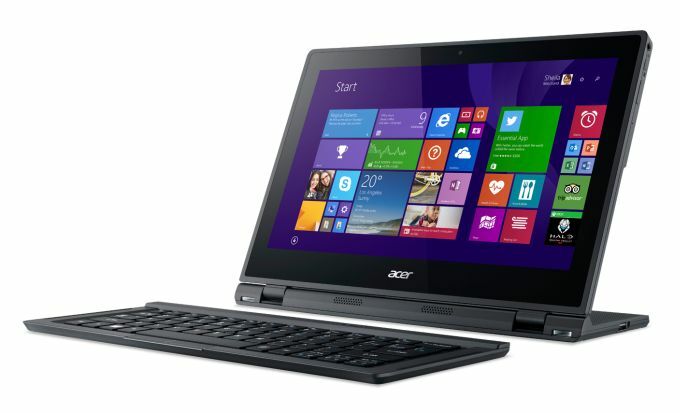 Aspire Switch 12 another expansion in its Hybrid Tablet lineup by Acer. Now-a-days Firm are coming with two-in-one device i.e. Tablet along with Laptop. Acer has come out with 5-in-1 innovative Technology i.e. Traditional laptop, Tablet, desktop. The startup range of this Hybrid will be from $380. Its last expansion in Switch family was Switch 10 with Windows vs 8.1 as operating system with Tablet and solid keyboard dock. Aspire Switch 12 comes with 12.5-inch HD display with Gorilla Glass and a pixel resolution of 1920 * 1200 pixels, it can be used in 5 different mode i.e. Tablet, Display, Tent( tablet & keyboard are attached to each other in tent position and screen faced toward the user) , Traditional desktop and Notebook. It will be available in two variants i.e. 60 GB and 120 GB. It will be powered with Intel core M processor and will run for 8-hours with a single charge. On the connectivity front, it will be enabled with MiMo dual-band Wi-Fi support, protector for screen, Dual front facing speaker for enhanced Audio, HDMI port and USB 3.0 port. It will be bundled with detachable keyboard and integrated stand. It is rumored that Latest iPad pro will have Screen size of 12.2-inch and add-on speaker for better sound. It will be as thin as iPhone and the biggest trend will be iOS, which is awarded best in terms of multitasking. It will be available on the shelves till first quarter of 2015 in US and Canada. Though, it has been rumored that Apple, Microsoft, Sony and Samsung are coming with Tablet which will have screen size of 12 to 14 inches. Their is no official announcement but with Christmas coming up all company will try to capture the market and register as World Leader.